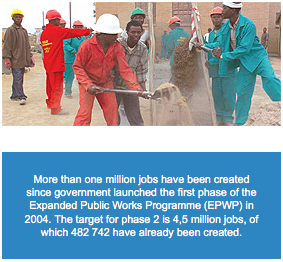 In his first State of the Nation Address in June 2009, President Jacob Zuma promised that the EPWP would create 500 000 work opportunities by December 2009. This was just a fraction of the 4,5 million work opportunities that have to be created in the next five years up to 2014. In addition to fighting poverty and creating jobs, government has been able to maintain infrastructure through the EPWP. This also helped to transfer skills and create work opportunities for unemployed people. Government started the Kamoso Awards (Kamoso is seSotho for 'future') to identify and reward people and organisations that have carried out government's EPWP job-creation programme with excellence. The finalists chosen last year are from three sectors, in different categories. These sectors are Social, Infrastructure and Environment and Culture. KwaZulu-Natal came out tops as the best province. This was in recognition of the different EPWP projects in progress in the province. These include the Zibambele Road Maintenance Project run by the province's Department of Transport, the Asbestos Cement Water Relay and the Platt Estate Invasive Alien Species Clearing Project. The main aim of the Zibambele (isiZulu for 'doing it ourselves') Project is to provide job opportunities for households headed by women. These women are given training skills in literacy and road maintenance. They are then employed to do maintenance of rural community access roads. The Asbestos Cement Water Relay Project involves the replacing of thousands of kilometres of asbestos cement water pipes in the eThekwini Municipality. The Limpopo province won some awards in the Social sector. These include the Manyeleti Youth Academy in the category for best innovative projects. The academy helps to give skills to young people who have been classified as youth in conflict with the law (previously known as juvenile offenders). A women-run co-operative providing meals as part of the school nutrition project also won an award in this category. The City of Johannesburg won an award in the Environment and Culture sector for various greening projects by City Parks. These include 2010 Legacy Projects, which saw thousands of trees planted in Soweto and other parts of Johannesburg.